Hearing back to help soon. This is a photo by friend @javaholicandtheboy. I met her when Josh and I were in Ireland at one of our @jjindublin events. 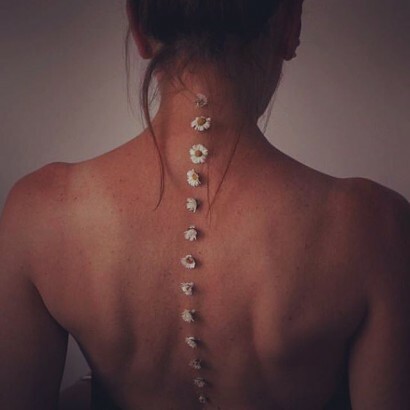 She captures simple life moments and infuses a ton of creativity. Most importantly she writes from the heart and isn’t afraid to share her ups, downs and struggles as a creative person. Plus, she is one friendly soul. Take a look at her work, tell her @kevinkuster sent you and give her a follow if you like what you see. I am sure you will! Okay guys let’s start sharing the people that inspire you and let’s build some connections and community today! Leave a comment below this photo and put down a username or two of people that inspire you that you think I should be following! This is Joe Cornflakes. He was lovingly referred to as “Cornflakes Joe” by a few of the relief workers. Joe’s house, garage, storage shed and RV camp site along with several RV’s were completely destroyed. Joe proudly told us he has been sober for over 25 years. He also told us he would often allow people struggling with problems to stay for free in one of his RVs and the camp while turning their life around. When Joe was visited by our local partner Dawn from she asked him how they could help? In a slow and deliberate southern accent he responded…. “I would really appreciate a bowl of cornflakes.” The following day Dawn brought him for four boxes of Cornflakes. Joe cried with gratitude and thanked her over and over. To see a man standing, surrounded by all of his earthly possessions destroyed yet still shows such gratitude for a simple gift of Cornflakes was truly moving for everyone on our tream. Gratitude like any muscle, grows stronger and stronger the more it is exercised. Even though Joe stood amongst so much distinction and chaos, Joe was easily the strongest person we met in Texas! Studying this photos will make you feel good! I don’t think anyone can look at this photo and not feel a sense of joy. The laughter on each persons face in this moment just make me so pleased. I truly love interacting with people and love trying to capture even the smallest glimmer of the human spirt. 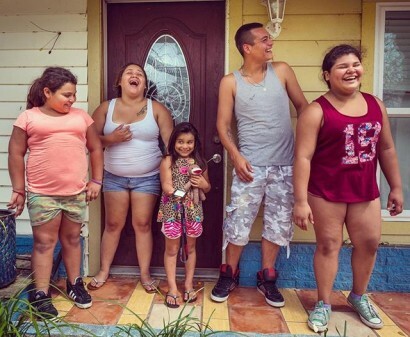 Even after seeing much of their town destroyed by Hurricane Harvey ,this family demonstrates that the human heart can and does remain resilient. 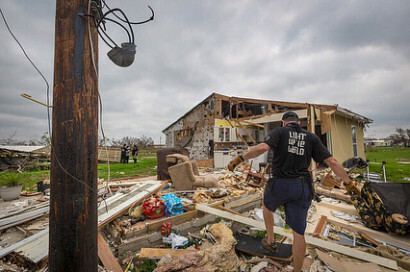 We saw the energy companies working night and day to get power lines up and running however, when your house is “mostly” destroyed and is the only place you have to live, they can not hook power up to a devastated home, what do you do for light? Hurricane Harvey Relief. There truly is something about the people of Texas. 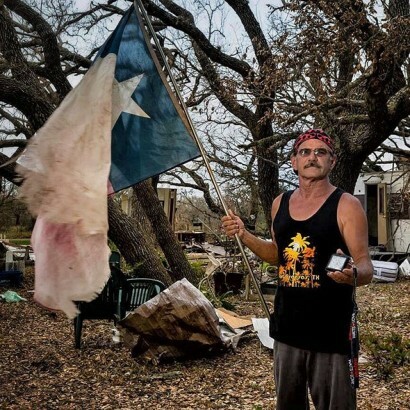 They are resilient, strong, and very proud to call themselves Texans. 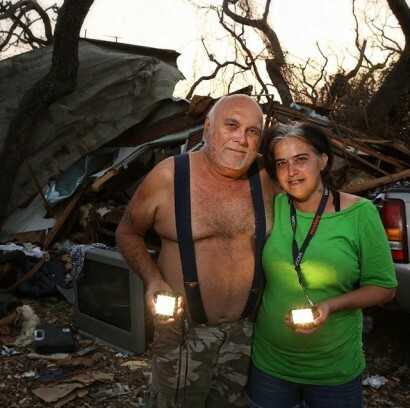 Although almost everyone we encountered had most of their worldly possessions completely destroyed each one of them said “we will rebuild.” Even more remarkably, each person we encountered and told them that we wanted to give them a light would automatically say… “I’m not as bad as my neighbor. You should really give them a light instead.” Texas pride runs deep and strong! Hurricane Harvey Relief. 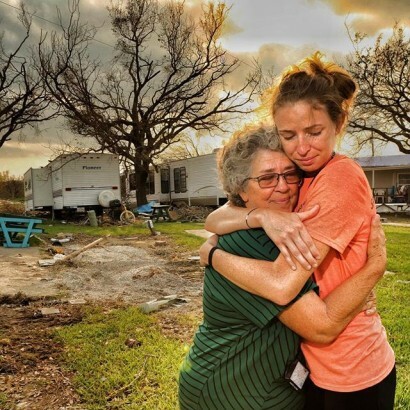 Although there is so much destruction, struggle and uncertainty in Rockport Texas there is also so much love! After we gave Kallie and her grandmother Linda their new solar lights, I asked them if I could photograph them separately. When Kallie was telling us how scared she was for her grandmas safety during the hurricane and how much she loved her, it immediately became obvious to me that I needed to photograph them together. As they began to hold one another I could see their love for one another. It was one of the most powerful moments I’ve ever experienced as a photographer. I lowered my camera to give them their sacred moment. I felt I was an united guest at a sacred moment. After a few moments, I slowly walked up to them and asked them if I could continue photographing them. I also asked if they would do me the honor of staying in their moment. They agreed and their moment of expressing their love for one another grew even deeper and deeper the longer they held each other. Tears of joy gently rolled down their cheeks. Their embrace tightened. And finally, both of them released the fearful thoughts and stress of what could have happened. Love is truly the most powerful force on earth. Day 2 Hurricane Harvey relief. This is Floyd and his daughter Christie. 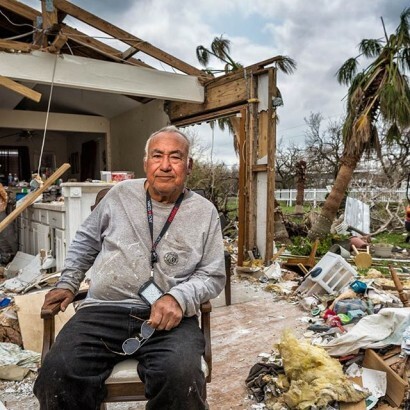 Floyd’s home of 20 years was severely damaged. Christie who lived right next door had her home completely torn apart. You can see some of the pieces of her home in the mangled trees behind them in this photo. When we first pulled up their home, they were eating under a plastic tarp and someone immediately said “If you don’t have candles for night, we don’t want anything.” We all laughed out loud. We don’t have candles but, we have something even better we responded. When I asked Christie to turn her light on for this photo she said “never seen such a bright light from something so small.” This is the second hurricane Floyd has survived and will have to rebuild from the devastation. Day 2 Hurricane Harvey Relief. 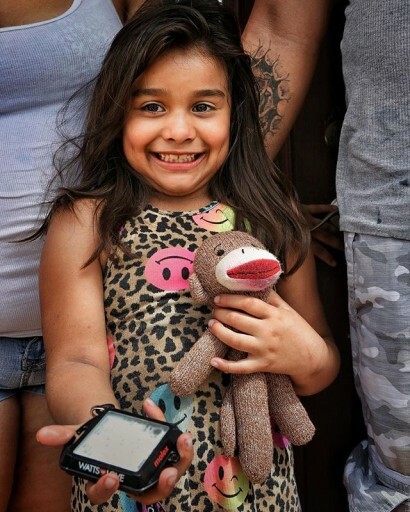 We could not decide what brought this Lilli more comfort, her little stuffed animal or her families new solar light. Most of the people we are serving are not expected to get electricity for at least 30 days. 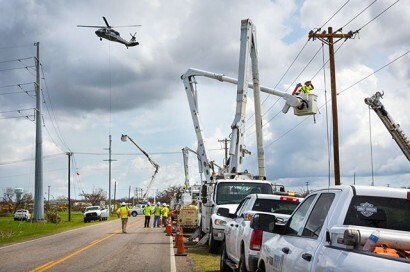 Although the electrical repair crews are working so hard and all over Corpus Christi, there are thousands of miles of down power lines and transformers. Day 1 Hurricane Havey relief. This is Leslie and Elaine. 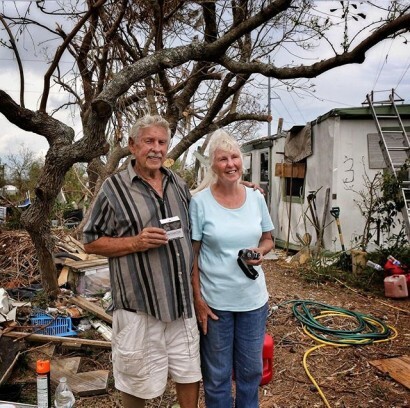 They had lived in their mobile home seen behind them for 20 years. The roof and walls are smashed, widows broken and all of their worldly possessions are soaked with rain water. I can only imagine that mold is starring to grow. When I asked them where they have been sleeping they pointed to their mobile home and said “where else could we stay? There.” Allan motioned to the trailer. When I asked him what they were doing for light at night he asked me to follow him into the trailer. The interior of his home was as bad as the exterior. Alan then showed me a small flash light pen. The kind of light a doctor might use to examine a patients throat. He had to shake it a few times to get it to work. 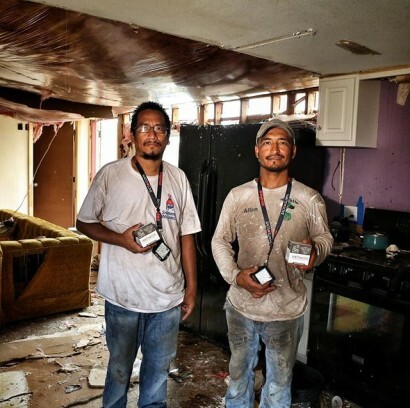 Although the human spirit is resilient and strong, having the proper tools to remain safe helps so much especially in a disaster area. When we were driving to our base camp last night, we were all so pleased to know that the last thing Leslie and Elaine would do is turn off a new and substantially brighter solar lighter light that no longer needed to be shaken to work. Thank you to everyone that helped put a light in this families hands. We are still accepting donations if you would like to help us with out mission to spread light, love and hope. Click the link in our bio to donate to Hurricane Harvey relief. As Alan repeated these words and told us about his experience, he had a constant smile and joy about him. Yes, joy. We couldn’t make this up! Alan was truly joyful. Joyful that he and his brother were safe and alive. Thank you to everyone that donated to allow us to help the people of Corpus Christi, TX. 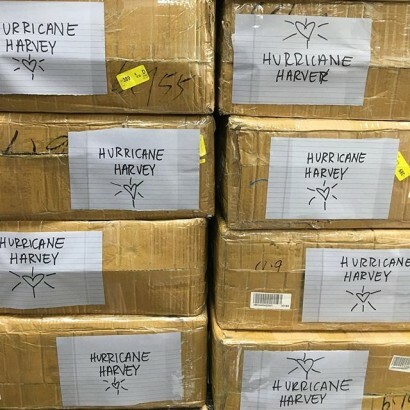 Day 1 Hurricane Havey relief. As we arrived in the first neighborhood to assist the families of Rockport TX it is eerily silent. No sounds of human activity. No kids playing. No dogs barking and most notable not a single bird singing. Just an occasional hum of a single generator off in the distance for someone lucky enough to have temporary power. This is Josh. When we met him he was helping his girlfriends grandma with her damaged house. When we asked him how his house was, he walked us over to his tiny house on wheels he was just in the process of completing. 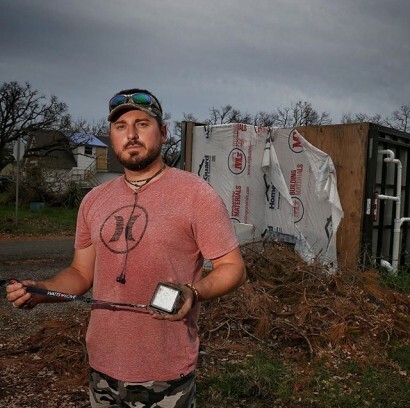 His tiny house can be seen overturned and can be seen behind him in this photo. We are so thankful to everyone has donated to @wattsoflove and allowed us to provide Josh this light. Tonight he will not sit in darkness. Josh, had a gentle and amazing heart. Solar light charged and ready to deploy to Corpus Christi Texas and the families that lost so much from Hurrican Harvey. To help click the link in my bio to donate. 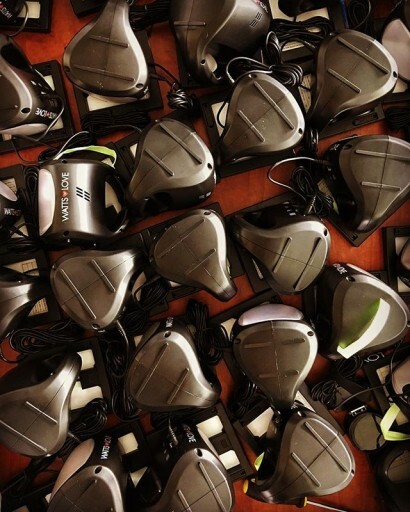 Donation goals reached, or not, we are shipping out 1,000 solar headlamps to Corpus Christie, Texas.